« What a Wild and Wooly Ride! 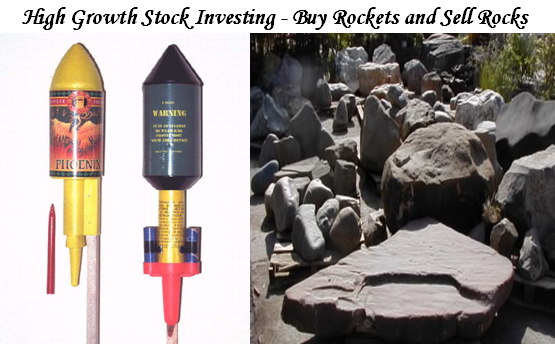 One of my slogans in High Growth Stock Investing is to Buy Rockets and Sell Rocks, and this is an excellent time to show you what I mean. In the course of a Long Bull Rally, there are always up and coming Giant Companies that are the bedrock of the move during that rally and are the undisputed Leaders of the period. In the snapshot below, I have shown you just one year in the five-year Bull Rally that has just ended of the five Giants of this particular era. I am sure there are several other fine companies that have done equally as well or even better, as I have shown you from time to time in the RonIandex examples posted on this blog. Please don’t get hung up on that point, they are the ones I have repeatedly featured as the key stocks to watch. Once the Party is over, these stocks are rich with profits and get whacked mercilessly. So the key principles of HGS Investing is to always have an Index of the top stocks in the top Industry Groups, the Wolf Packs, and pick out the top five to watch as well. I don’t need to belabor the point, the facts speak for themselves in the above picture of the top five and the latest RonIandex which was generated at the end of 2007 shown below. 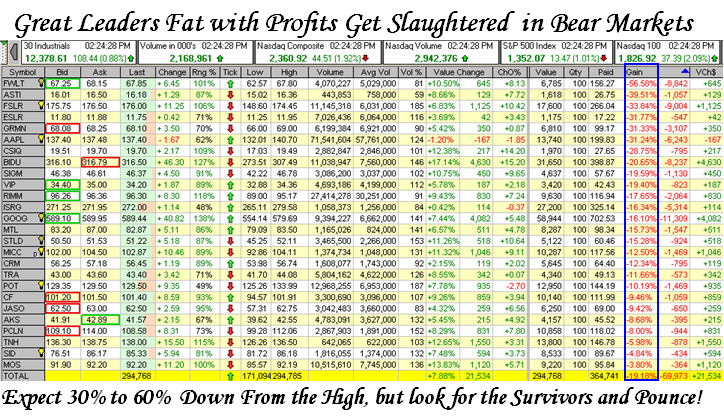 Day Traders are looking for a quick pop to garner profits for the day to put food on the table. Swing Traders who are bottom fishing on stocks with strong credentials hoping that the worst is over and they can make a better than 10% gain in a week or two or three, but have tight stops. 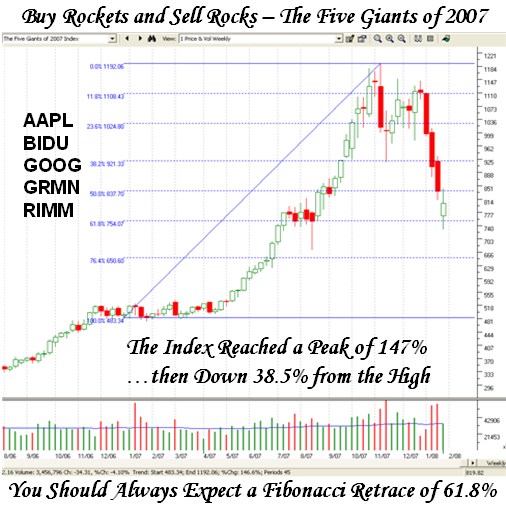 Long Term Buy and Hold types, who feel they had missed the boat on these great stocks and that in the scheme of things this is an ideal place to take positions in the undisputed winners such as AAPL, GOOG and RIMM to buy and hold hopefully for the next ride. The reasoning is that if the likes of Qualcom (QCOM) can get to over $900 in the last big move prior to 2000, then surely we are only halfway if that with the future still ahead for GOOG! So it goes, Hope, Fear and Greed and different Investing Styles will drive the Market. The underlying principle I espouse is to buy QUALITY and that is defined by strong earnings, “E” with strong Relative Strength “R” in Strong Industry Groups “G”, preferably the leaders in the wolf pack. When in doubt, always look for high quality. As long as a company continues to report solid earnings, its stock will do well. The HGSI software makes it easy to spy the High ERG stocks. Now if you are prepared to step up to the plate and are nimble traders, you know what you are doing and go for it. But for the longer term investors the prudent thing to do is to be patient and pounce when we give you the all clear. To sober you up to the realities of what we face in terms of a skittish market just look at the intra-day swings today in the DOW. It’s called Moment Trading! The swings are 50 to 75 to 100 to 150 points…you pick the time of the day! Just the times we live in when we have swindlers causing $7Billion fraud which could also have been instrumental in the Fed easing as much as it did…go figure. Best Regards, Ian. 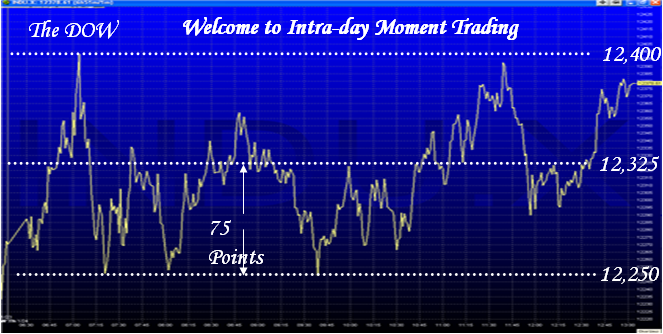 This entry was posted on Thursday, January 24th, 2008 at 6:01 pm	and is filed under HGS Principles, Market Analysis. You can follow any responses to this entry through the RSS 2.0 feed. Both comments and pings are currently closed.